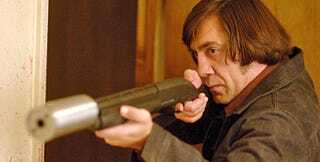 The Cohen Brothers hit No Country For Old Men featured one of the best villains in modern times played by bowl cut wearing Javier Berdem. As a hitman, his weapons of choice were a cattle killing air compressor and a shotgun with a suppressor. After much internet debate as to such a suppressor's size and effectiveness, it appears that SilencerCo has built one that really works. Top Shot winner Chris Cheng is shown in the video above putting the suppressor through its paces at the range and it looks like it not only reduces muzzle blast and the firearm's report, but also its felt recoil. The "Salvo 12" as SilencerCo calls it, is a modular system, whereby the minimum size is about 6.5 inches, with three other larger models available for further dampening. Around 12 inches is the longest "stock" configuration available. From what I can tell, this should be the first commercially available shotgun suppressor and there may very well be some highly useful military applications for such a compact and reliable system. This is especially true for entry teams and for clandestine operators that regularly work with suppressed weapons. Being able to bring a suppressed shotgun along on missions would offer a lot of versatility and stopping power that centerfire rifles and pistols simply don't provide. Also, using one in close quarters would drastically lower noise ringing effects of firing a non-suppressed shotgun. This is especially relevant when operating within maritime targets such as ships and oil rigs. Lead picture via IMDB, special forces shotgun guy via DoD.